The DDGC has always prided itself on having unique and special trophies for its winners, some coming out better than others. Sooner than we expected and sooner than we’ve ever had before, the trophies for DDGC17 are already done and in our hands. And we can’t resist showing them off. Cut from wrought iron with a powder-coat finish, they are the design of Kyle Enman and the handiwork of Kyle and his co-worker Matt Belliveau (Matt did the cutting, Kyle did the powder-coat). These easily rank in our top 3 trophies ever and a strong case could be made that these are the best we’ve ever offered. 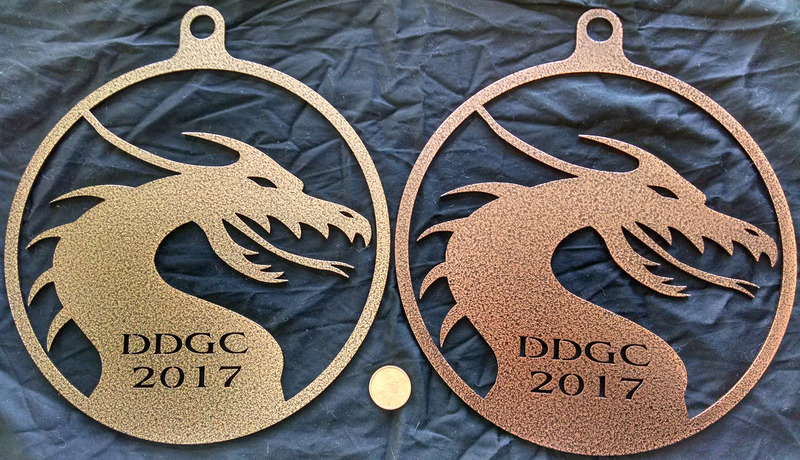 The winner in each division will go home with one of these in the “gold-vein” powdercoat, while second place in select divisions will get the “penny-vein” versions. Without further ado, here they are. A Sacagawea dollar coin is included in the pictures for scale. Who wants one? Start practicing now and be at your best on June 3, and you might just win one.